Automatically detect 12V or 24V battery. Low battery activation voltage (3V). 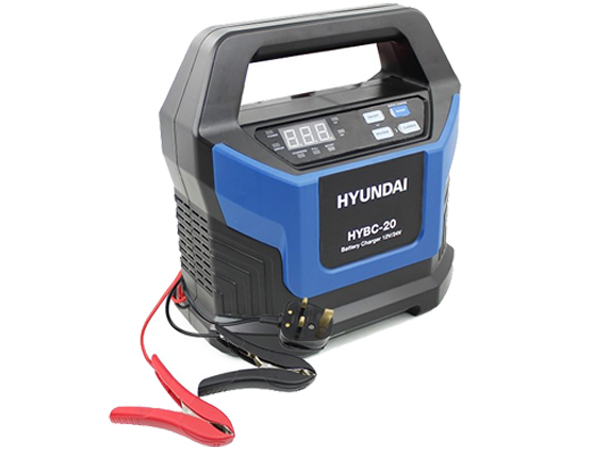 The HYBC-20 is a 230V Battery Boost Charger from Hyundai. Designed for charging all types of 12V and 24V lead-acid batteries, including WET (Flooded), MF (Maintenance-Free), EFB (Enhanced Flooded Battery), GEL, AGM (Absorbed Glass Mat) batteries. It is suitable for charging battery capacities from 2 to 400 amp-hours and maintaining all battery sizes. The HYBC-20 features a built in intelligent microprocessor making charging faster, easier and safer. The safety features include spark proof, protection for reverse polarity, short circuit, overheat and overcharge. The HYBC-20 automatically detects 12V or 24V batteries or selected manually within 10 seconds of starting and shows present voltage when voltage button is pressed. The HYBC-20 Hyundai battery charger features an advanced 'boost' mode for 12v lead-acid batteries, within 5 minutes the battery will be charged and you are ready to start your vehicle. When the charging LED is on, it is charging, when the charging LED is off and full LED is on the charging is complete. But do not break the connection immediately. It will automatically switch from full charge to maintenance status without overcharging or damaging the battery. In the box: HYBC-20, user manual & cable clamps.